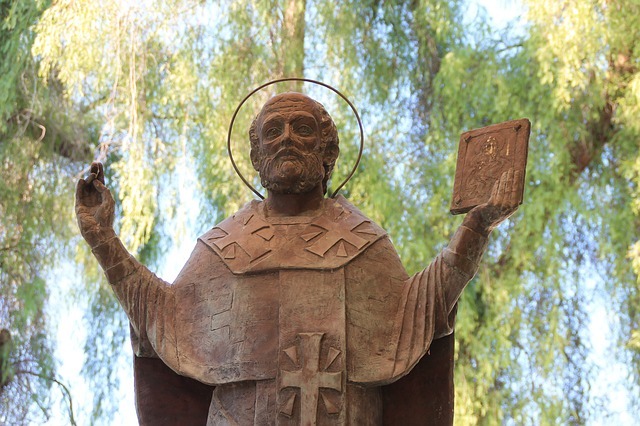 Traditions surrounding Saint Nicholas, Bishop of Myra and “the real Santa Claus,” whose feast day is December 6, recall his legendary love for God, children, and the poor. Here are some ways to honor the memory of this ancient gift-giver, offsetting the commercialization of Christmas and re-centering the season’s true spirit on Jesus. Saint Nicholas’ feast day, December 6th, is the perfect opportunity for small acts of kindness or service. As the date approaches, gather your family and brainstorm a list of kind deeds or small homemade gifts for the needy. Encourage children to keep secret their giving to family members. Lead by example; let them know you’re planning your own surprises for others. Discuss the real Saint Nicholas. For young ones, find a worthwhile account of his story in simple language. Older children will enjoy researching him online. In many countries, Saint Nicholas’ feast day remains the principal gift-giving day of the season. Shifting your family’s gift exchanging, partially at least, to this date would allow for a more devout celebration of Jesus’ birth on Christmas. Simple crafts children can make to represent this beloved Saint include a bishop’s miter, staff, or pectoral cross; a boat representing Nicholas’ patronage of sailors and sea travelers; a money sack recalling his goodness to the poor. Researching legends surrounding his life will generate ideas for additional activities families can work on together. Make this the year you start your family on a new, de-stressed path to the approach of Christmas. Saint Nicholas can lead you toward a more charitable, less me-centered celebration of Jesus’ birth. He loves to give — just ask him!